A quilt is never just fabric sewn together. It’s an expression of joy, love, sadness, loss, and hope. It is the comfort of a warm embrace or a lasting memory. I became aware of the true power of this craft when asked by Wendy Davis to write this piece about PSI’s quilt. The origins of our quilt began with PSI founder, Jane Honikman, and her 2001 Call for Names Project. This project honored the memory of women who died because of a postpartum mood disorder. Beginning in 2002 these names have been read aloud each year at PSI’s annual conference. 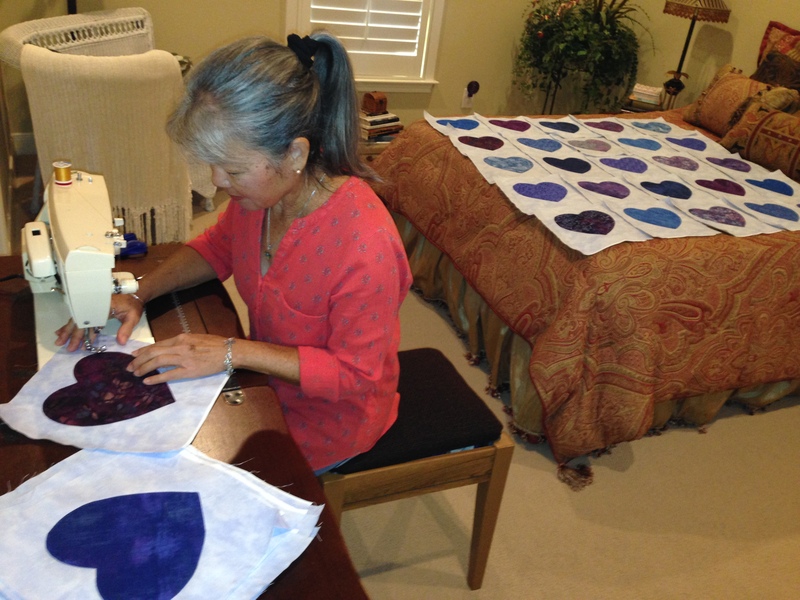 In 2005 Nancy Roberts, Michigan PSI coordinator, suggested to Jane and Wendy Davis, Postpartum Support International’s executive director, the concept of creating a queen sized memory quilt; they readily agreed. Nancy’s sister, Jane Leslie, died by suicide during a severe, undiagnosed and untreated postpartum mood disorder. The creation was a family affair; her mom donated fabric and sisters, Becky Keck and Sue Castor, along with sister-in-law, Virginia Latz, all worked on the quilt. There is a picture on the bottom of the quilt of Jane Leslie and her 3 sisters. This beautiful piece of art was revealed for the first time at the 2006 New Jersey PSI conference. Until 2015, Nancy managed the quilt’s travels to various maternal health events throughout the US, at which time Lianne Swanson, PSI office coordinator, became its new director of travel. In the last 10 months she has overseen its journey to 16 events in 20 states – including California, Arizona, Oklahoma, New York, Texas, Florida, Connecticut, Michigan, and New Jersey. The event facilitators were each moved by the impact thee quilt had on those in attendance. Kym Dunton, clinical nurse educator and coordinator of Women’s Health Strategy for Baptist Health in Jacksonville, Florida, first became aware of PPMD while attending a conference in Toronto in 2000. “During the event, the city experienced a tragedy that made headline news and shocked us all. A beautiful, smart, prominent Toronto physician purposely jumped in front of the train one early morning with her six-month old son in her arms…. I followed the story and learned she was suffering from postpartum depression. That was the moment I knew I needed to be involved with PSI. When, several years later, I attended my first PSI training in Chicago, I saw the beautiful quilt. In the top corner was the name of this mother and child. Tears flowed.” This past May, Dunton used the quilt for an endowed lecture with keynote speakers, Dr. Wendy Davis and Valerie Plame Wilson, a former CIA agent who suffered from postpartum depression. As a secondary benefit she made a lasting connection with a Texas PSI volunteer who “went out of her way to ship it priority” so it would make it in time for our event. Nancy Owen, an RN who runs a postpartum support group at Millard Fillmore Hospital near Buffalo, NY brought the quilt to the showing of The Dark Side of the Moon and then to the staff on the postpartum unit. She noted the quilt is both “somber and precious. It takes your breath away.” There’s a sense that it’s sacred to those in whose charge it is, as described by Nancy when talking about the great concern she had about careful packing and its safe arrival at the next destination. In 2016, Donna began an initiative for a second quilt. Demand is so high for the original quilt across the country and the logistics were increasingly challenging that she approached PSI to see if a second quilt would be welcome. It is being designed like the first, with hearts and names, but the color scheme of the new quilt is in the blue/violet range instead of reds and pinks. After researching the quilt’s history and meeting Donna and others, and seeing their strong reactions to it, I was struck by two prevalent thoughts about the quilt’s power. One is its use as a silent tool, both visual and tactile, that provokes an emotional awareness, at times stronger than the spoken word. And a notable reflection from most of the women I spoke with of the bond created with those who had possession of the quilt both before and after they did, threaded together in an effort to not only support women and families but to ensure the safest journey for this sacred memento. Reading about the women behind the embroidered names is difficult. They are our sisters, daughters, our friends and, for many, they are us but for whatever it was that put us on a road toward survival. We have hope that fewer women in the future will become those women, thanks to the great efforts of PSI, its sister organizations, and all those who have devoted so much of their time to make certain we know we are not alone. 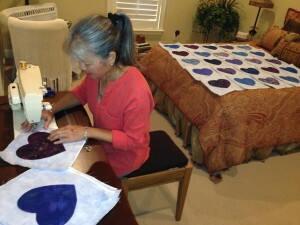 PSI member Donna Kreuzer led our work on an additional memory quilt. The memory quilt was presented at the 30th annual PSI Conference in Philadelphia Pennsylvania on July 14, 2017. We were honored to have many family members present.